Controversy over polygamy in Egypt is far from new. The battle between religious scholars and women’s rights activists and organizations has been ongoing for years. While the latter is pushing for laws that ban or at least regulate polygamy, the former rejects any restriction of a right given by the Quran to male Muslims. Meanwhile, the majority of Egyptians seem to prefer the status quo, so supporters of a change lack both leverage and popular backing. It was only when the Grand Imam of al-Azhar, the most prominent religious institution in Sunni Islam, stepped in that a turning point began to seem possible. In his weekly televised interview, Sheikh Ahmed al-Tayeb said that in 90 percent of cases polygamy is unfair for women, children, and families. He argued that the current perception of polygamy is based on a distorted understanding of Islam. “Polygamy is not an absolute right,” he said. “It is restricted by a number of conditions, on top of which is fairness. Otherwise, it is not permitted.” As expected, a heated debate ensued. Approval was as fervent as objection, as both camps wondered whether these statements mean that a law regulating polygamy is underway. Both the hopes and concerns that al-Tayeb’s statements triggered are valid, since the personal status law is already being reviewed by a specialized committee at al-Azhar. Everyone is wondering whether restrictions on polygamy will be among the modifications. It is not clear what kind of restrictions will be introduced. But most likely a man would need to obtain legal permission before taking a second wife, and to do this, he would have to state his reasons. These might include the first wife’s health condition or inability to have children, for example, or proof that the second marriage would not harm the first wife and her children. The wife would also have the right to take the husband to court if his second marriage violated the new law, and might also be granted divorce if she wishes. The second wife would also need to approve, and thus would have to be officially notified her husband-to-be is already married. The feasibility of monitoring these conditions and ascertaining that no harm is done to any of the parties is questionable, though. What if the reasons the man offers for taking a second wife can in no way be proven? Emotional ones, for example? How can fairness be guaranteed? Is it only measured by the man’s ability to support both his wives financially? What about other damages the women might sustain, or the children for that matter? What kind of law can stop a man from lying to both his wives, especially if his first wife’s name is not on his national identification document? A ban, then, seems more practical, yet almost impossible. The negative reaction of most Egyptians to the equal inheritance law issued in Tunisia in 2018 is revealing. In fact, many responses that condemned al-Tayeb’s statements on social media mentioned Tunisia, where polygamy has been banned since the 1950s, as an example of a Muslim country that violates Islamic laws. Apart from average Egyptians, resistance by ultra-conservative clerics and their supporters – and there are many of them – is hard to overlook. Al-Tayeb’s remarks were followed by a counter-campaign launched by Sameh Abdel Hamid Hamouda, a Salafi preacher and former member of al-Nour Party. The campaign, called “Let him have many,” is based on the argument that polygamy is the solution for the current marriage problem in Egypt. The idea is that as many women as possible would get married if each man married more than one. It is the duty of rich men, said many supporters of the campaign, to marry up to four. Several voices from inside al-Azhar declared they subscribed to the same view. Online pro-polygamy campaigns launched by women in the past few years also lend the campaign credibility. 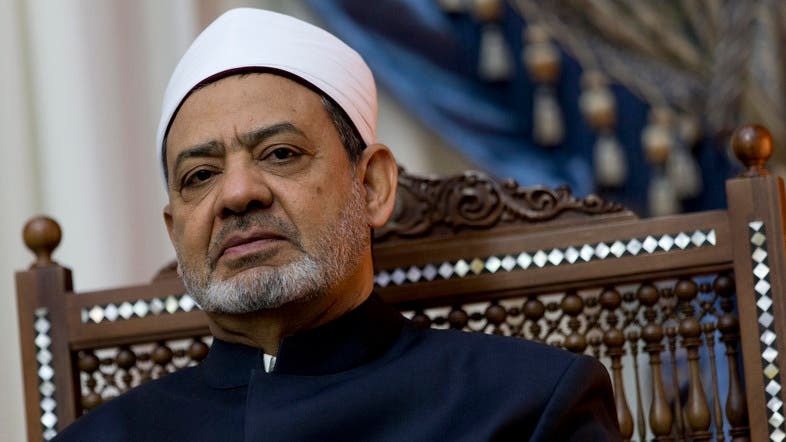 The pressure to which al-Tayeb was subjected and questions about a possible ban drove al-Azhar to issue a statement clarifying what the imam meant, in order to avoid any misunderstanding. According to the statement, he never intended to suggest banning polygamy, but rather restricting it in order to make sure no injustice is done to women and their families. The statement was obviously meant to appease both camps. But it did not really work as planned, because while women’s rights activists are not yet disappointed, Salafis are far from content. This is expected to last until the amendments to the personal status law are made public. While a ban is not obviously on the table, any form of restriction is bound to cause a great row among conservative clerics and citizens alike. The reaction of MPs, who will discuss the draft law and approve or disapprove it, is also unpredictable. One fact cannot be overlooked: al-Azhar is the highest religious authority in Egypt and its fatwas are treated with considerable reverence, even amid the influence of other more conservative groups. Al-Azhar and the state have not been on the best of terms as far as renewing religious discourse is concerned. There have been several incidents in which al-Tayeb and President Abdel Fattah al-Sisi were at loggerheads. The most memorable one was in 2017, when al-Sisi demanded that verbal divorce should not count as legally valid and al-Tayeb refused. On several other occasions, the imam indirectly criticized al-Sisi’s approach to renewing religious discourse, in what seemed to be a struggle for the independence of al-Azhar and for religious authority. Al-Azhar’s statement about polygamy could signal a rapprochement between al-Sisi and al-Tayeb, one in which a compromise is reached about the modernization of Islamic laws. If this is the case, then a law will pass, and polygamy will be restricted in one way or another. Whether it will work on the ground remains to be seen. It is highly unlikely that the law will have any popular support. What is likely, though, is that it will shake the credibility of al-Azhar, even if slightly.